Dece Gambe, Festival Director, The Venus Bushfires musician, Hugh Edwin Jones, students from Coleg Menai. Kaya Festival at Coleg Menai. 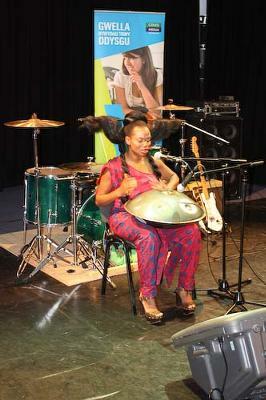 The Venus Bushfire with Kaya Festival at Coleg Menai. 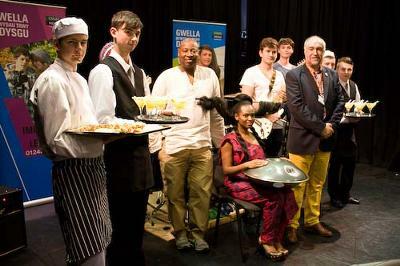 The sounds and flavours of Africa and the Caribbean Islands came to Bangor today. Organisers of Kaya Festival, a new music festival coming to the Vaynol Estate, Bangor, 1–3 June, are working closely with Coleg Menai to provide significant work experience placements. Festival organisers want to leave a positive economic footprint from the festival and working with the local community is part of the Kaya Festival philosophy. "Coleg Menai has been enormously supportive; we are determined to develop the talents of local young people," said Festival Director Dece Gambe. 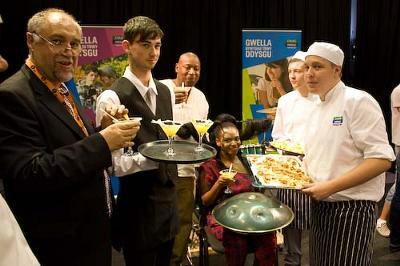 Catering and Hospitality students are working with the Kaya backstage hospitality team, providing catering for artists and VIPs. Creative Arts students will provide an outside broadcast team to record the event and tell stories from the festival. "The benefits of gaining real-life work experiences are invaluable; challenging placements are interesting and improve skills. They also help when applying for jobs and entering the world of work," said Aled Jones-Griffith, Coleg Menai Faculty Director. Local young people have their own "Do Youth Day" within the main festival on Saturday, with a PA from MC star Tinchy Stryder, creative workshops and the British DJ&MC Academy encouraging local talent. Coleg Menai, Careers Wales and local training providers will offer apprenticeships, mentoring and training opportunities. the Welsh Government, Gwynedd Council and the Arts Council of Wales, which recognise the economic benefit of fostering the creative industry in Wales. The inaugural event has received £50k support from the Welsh Government. Sian Tomos, Director, Enterprise and Regeneration, Arts Council of Wales said: "The Arts Council of Wales has been struck by Kaya Festival’s commitment to promoting local creative skills and job opportunities through linking local organisations with top level international artists. With the Creative Sector being one of the driving forces of economic growth at the moment, it’s vital that we inspire and encourage our communities through providing high quality opportunities to engage with it. Kaya Festival offers that in addition to bringing a really high quality artistic festival to Bangor for everyone to enjoy in its own right." The festival will appeal to locals and "world music" fans from outside the area looking to have a great festival experience. 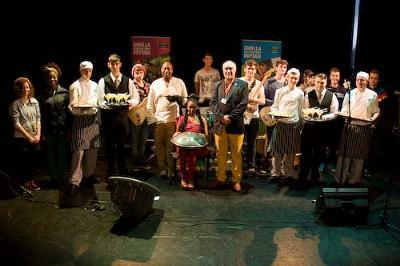 The Kaya Festival philosophy is to engage with local young people, broadening their skills and experience. "Big things start from small beginnings and our smaller capacity family festival will offer a uniquely intimate music experience and provide big economic benefits to the area," said Dece. For more local stories and news, subscribe to our free Anglesey Newsletter here. It's as easy as 1-2-3! Students from the Menai just made this Kaya festival a beautiful and colorful one. All the credit goes to the great director of the festival. The organizers have definitely brought a positive economic footprint about this festival to the public. we'll try to get along to this, loohs good! thanks for sharing.